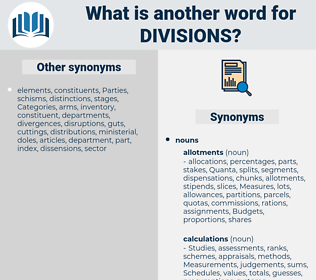 What is another word for divisions? jurisdictions, services, commons, boards, panels, senates, rooms, engineers, Bureaus, managers, tribunals, peoples, chambres, people, chambers, utilities, Lawyers, teachers, subsectors, Trustees, Secretaries. consolidated, amalgamation, consolidate, qualifications, combined, DIR, obligations, subsectors, credentials, issues, subparagraph, unification, merging, merged, combine, Securities, credential, governors, merge, degrees, merger, mergers, Ean, equity, Trustees, Les, divison, DIV, dividing, splitting, secretary, Secretaries. disproportions, discrimination, discriminations, distortions, diversions, disposition, dispositions, directorates-general, directorate-generals, Contradictions, differentiations, commissions, dimensions, jurisdictions, connections, instructions, misunderstandings, subsections, accommodations, disagreements, differences, governorates, discrepancies, Inconsistencies, directorships, Diversities, tensions, variations, allegations, Controversies, deviations, portions, accusations, divergencies, dispatch, by-elections, descriptions, situations, squads, Households, disciplines, antagonisms, detachments, chiefdoms, factions, unions, interests, opinions, Orientations, tiers, echelons, subregions, subfractions, subdistricts, odds, circumstances, groupings, decisions, Stations, troops, Hostilities, Sciences, constituents, subzones, honours, Industries, sub-categories, instructors, boards, frictions, locations, fields, limitations, bounds, holdings, frontiers, chains, provinces, segments, sharing, sub-sections, compartments, clubs, sub-groups, Difficulties, breakdowns, Ditches, dos, replicates, stovepipes, contrasts, bones, organs, rounds, factors, Islands, minutes, Agencies, elements, splittists, townships, Schools, panels, joints, wings, sub-units, zones, subclauses, Dependencies, precincts, trends, Diplomas, wards, rooms, relationships, variances, sides, imbalances, instalments, ways, periods, electorates, ranks, opposites, Paradoxes, avenues, points, subgroups, suites, bonds, engineers, relations, links, rows, brothers, components, means, inequities, hives, bedrooms, agrees, quarters, CENTS, Schedules, stripes, slices, panes, silos, asymmetries, fronts, scores, Classes, brackets, ethics, papers, VOTES, newspapers, sub-centres, clashes, desks, conflicts, Storerooms, Families, respects, managers, practitioners, differentials, parlours, filiales, barriers, profiles, courtrooms, Ones, Guidelines, blocks, Counties, bulkheads, subclasses, awards, tribunals, increments, sticks, obstacles, masters, Bodies, tranches, seats, separatists, hours, peoples, sites, CAMPS, chambres, sub-items, slots, grades, milestones, circles, troupes, Municipalities, Boxes, arms, principals, spheres, report, CREWS, cinemas, Houses, slabs, feuds, pillars, legs, borders, landmarks, heads, Wars, flats, clusters, sets, venues, fights, Programs, gaps, arguments, levels, chasms, Cells, quarrels, swathes, Rivalries, gates, channels, routes, views, linkages, structure, tiles, Faculties, modules, lounges, patterns, volumes, PATHWAYS, people, estimates, ties, localities, ranges, Patches, vaults, ballots, Plants, stretches, struggles, Fractures, certificates, gulfs, Phases, chambers, accountants, futures, pieces, room, exchanges, battles, benchmarks, halls, classrooms, planners, Charges, markers, tubes, Angles, flights, marks, contexts, affiliates, Clients, twigs, Bays, stages, subjects, apartments, utilities, limbs, Permits, debates, Capacities, exhibits, PAGES, spaces, circuits, Paths, runs, streams, releases, agents, items, walks, frames, passages, tabs, walls, Facilities, themes, limits, titres, Tracks, doctors, actors, reaches, Parties, Cues, Characters, Cameras, teachers, types, pipes, qualifications, paragraphs, figures, LINEs, subsectors, credentials, merging, Securities, governors, degrees, mergers, Secretaries. districts, courts, Houses, architects, sub-sectors, sections, directorates, departments, splits, Branches, directions. 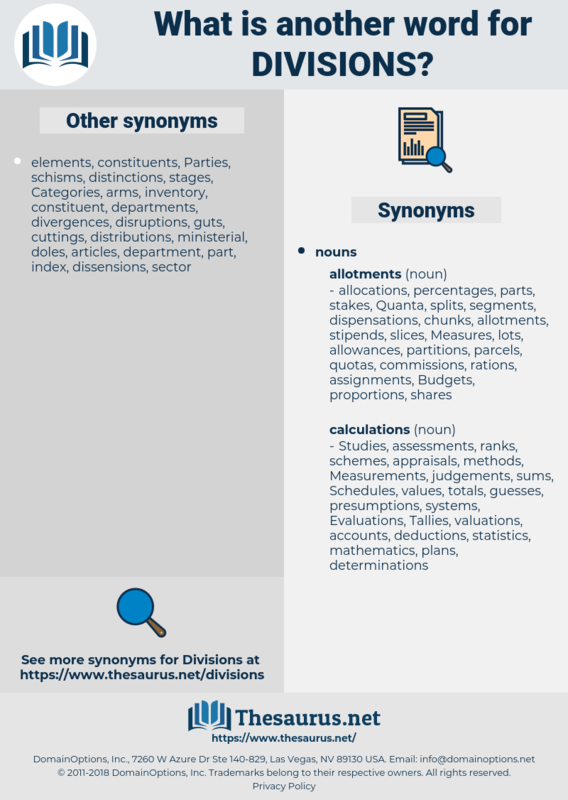 sub-sector, questions, sub-sectors, kinds, deeds, section, sections, divisional, directorate, directorates, department, departments, split, splits, divide, branch, Branches, direction, directions. distinctions, distribution, distributions, battalions, disruptions, Classifications, administrations, corporations, divergences, divides, confrontations, platoons, divestitures, districts, proportions, brigades, Disparities, Constituencies, operations, dissents, allocations, commands, Litigations, contingent, contingents, services, partitions, dividers, Subsidiaries, committees, disputes, offices, courts, colleges, Inequalities, ridings, bands, managements, Benches, Bureaus, Categories, schisms, Addresses, fissures, rifts, cleavages, officers, chamber, cracks, premises, architects, sub-sectors, kinds, deeds, sections, directorates, splits, branch, Branches, directions. But if party lines did not yet accurately represent the divisions of opinion on these questions, there was, nevertheless, a grouping of men according to their opinions on the general question which already had its effects in politics. The law made the constituencies by geographical divisions; and they are not bound together by close unity of belief. dipsomania, dapsone, dibucaine, diapason, diffusion, dipogon, dobson, depokene.